Looking more like Apple’s Passport App coming with iOS 6. Makes sense for Apple to include Mobile Payments capability. Who are (some of) the players in mobile payments? Good breakdown of some of the major players (USA) in Mobile Payments. Having spent some time researching different players in the mobile payments space, I have come up with a list focused primarily on Europe and the U.S. The list is sorted alphabetically by the brand name (followed by an organization, if applicable) and may include companies, exchanges, associations and resellers. Its purpose, and that of the accompanying Venn diagram, is to have a visual representation of the mobile payment players and their direct/indirect competitors. How did they get where they are? Did they grow organically or by acquisition or merger? I have included as much information as I have about each organization. A recent survey conducted in the USA by Harris Interactive for Apigee, an online API management platform, has indicated that shoppers will be using their mobile phones more than ever. Many smartphone users have come to expect more than just an online presence from retailers, especially the younger demographic – where a smartphone app is becoming more important, as it allows them to do more when they are out shopping. Venture Beat Article is here. Explosion in mobile traffic by 2016! Coles Supermarkets today announced that they had finally completed the rollout of Contactless Payments across 750 Supermarkets adding another 14,000 terminals to the MasterCard PayPass network that now numbers over 100,000 terminals across Australia. They join 7-Eleven, McDonalds, Bunnings, Dymocks, Australia Post, IGA Supermarkets, Chemists and numerous other retailers gearing up with contactless (tap and go) capability that can shave over 25% of the time off the payment process. Cabcharge has also rolled out over 20,000 contactless terminals in taxis and recently hit the 2 Million contactless payment transaction mark. 7-Eleven, one of the early adopters noted that the payment process can be cut from 35 seconds for a mag stripe / pin entry to 4-6 seconds with contactless, a significant time saver. There have been some consumer security concerns raised (as no PIN is required), but as the transactions are limited to low value (currently under $35) and both Visa and MasterCard have clearly stated that card holders will not be responsible for fraudulent use of their cards – this should not be an issue in the longer run. A recent Deloitte study stated that 80% of of the total Australian cash transactions are currently under $35 amounting to some $470 Million a day moving through the Australian economy – significant numbers and significant time savings if these switch to contactless. Consumers will get to love the convenience and speed of payment afforded by contactless and as the number of contactless cards issued by banks increase, the usage and take up will be much wider reducing the use of cash significantly. Currently it is estimated that usage of contactless cards has risen from 7% of the total population last year to over 14% this year with card ownership up to 35%. 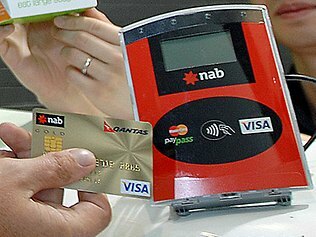 Having this extensive contacless infrastructure in place in place puts Australia in a great position with the release of the new iPhone 5 scheduled for late September that is almost certainly going to come out with a Near Field Communication (NFC) chip that will also be able to be used with contactless terminals for tap and go payment. Westpac has just started a pilot program for NFC equipped Android phones with the Google Wallet – which will allow customers to tap their phone instead of their card. Interesting how leading UK Supermarkets Tesco and Sainsbury’s are leveraging their online traffic to get into Video On Demand and go head to head with Netflix and the like. The UK’s number-three supermarket is preparing to turn itself in to an online movie and TV rental service, as it vies with with leader Tesco on digital devices, just as they have in the aisles. Sainsbury’s is contracting video tech firm Rovi to power video on demand and for download in a service due to launch later this year under its new Sainsbury’s Entertainment brand. Rovi promised paidContent “a transactional-based model that supports the sale and rental of premium titles versus a subscription-based service”. The service will launch initially on web and Sainsbury’s says it wants to take it later to internet TVs, Blu-ray disc players, smartphones and game consoles. Sainsbury’s movie and TV offering will go head-to-head with Blinkbox, which Tesco acquired a majority of last year. Expect to see each supermarket competing with Netflix, Amazon’s Lovefilm, BSkyB and other dedicated VOD brands on internet TVs next year. Apple has also set the benchmark for retail in terms of sales and profit per square foot (more than double 2nd placed Tiffany’s) as well as sales and profit per employee. 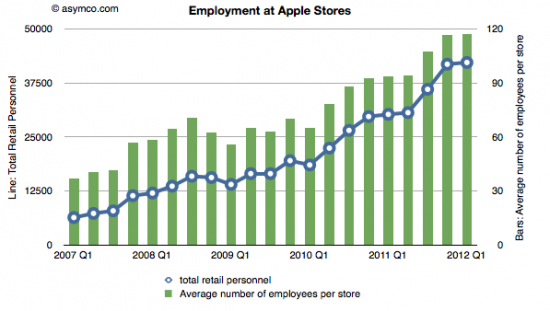 Last year in Apple’s 327 stores globally each Apple retail store employee brought in $473,000. The products are desirable and the staff are astonishingly good at selling them (even though they are not on commission). There have been some rumblings about staff wage levels and staff retention in the US, however there is always a plentiful supply of bright young people lining up to apply for jobs at Apple stores – they can still take their pick of the best. Why is this? I think it has a lot to do with the strong Apple brand and the consistency of the customer experience with Apple products; whether that is online, in store or when they get home an unbox the latest iPhone or iPad. A consistently great experiences. Store staff are well trained and empowered to solve customer problems straight away, they have access to all the information they need on their iPod Touch or iPad and their store retail application is well integrated with their website including their Genius Bar booking system. Apple are even taking this a step further with their Apple Store iPhone app where customers can go into a store and buy a (admittedly a lower price point) product and pay for it with their iTunes account using their iPhone and walk out – without the need to even interact with any Apple Store staff. Recently Apple’s new head of Retail John Browett, who took the reins in April, was looking at tinkering (read reducing) with Apple’s store staffing levels, using new schedules and staffing formulas. However this was quickly hit on the head (most likely by CEO Tim Cook), with Browett coming out and saying that “We messed up”.